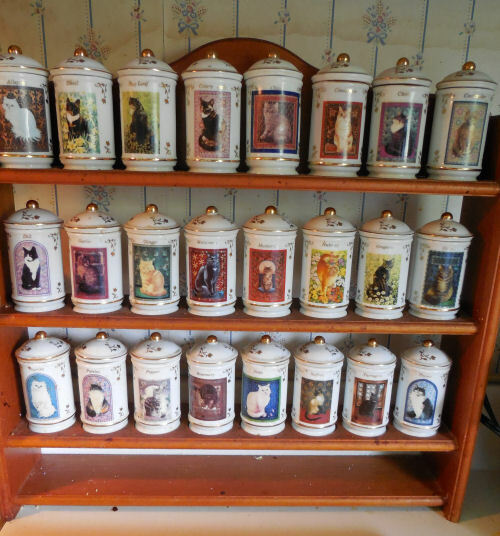 Cats of Distinction Spice Jars Have increased in Value over the years. Anyone who looks on eBay, Ruby Lane, or other sites that sell vintage items will see old kitchen items that you may have used at some point being offered for sale. Today, I discovered that my lovely Cat Spice Jars are now in that category. I discovered this little gem of information when I was responding to a comment on a recent recipe for snicker doodle bread. The lady who wrote the comment asked me where she could purchase the cat spice jars shown in one of the photos. I responded by telling her that I had purchased them in Australia about 30 years ago and doubted you could get them now. After I posted the comment, I searched in Google for “cat spice jars,” and lo and behold, there were my prize kitties! They were made by Lenox china and are being offered now as by Replacements Ltd. Most range from $30 to $40. 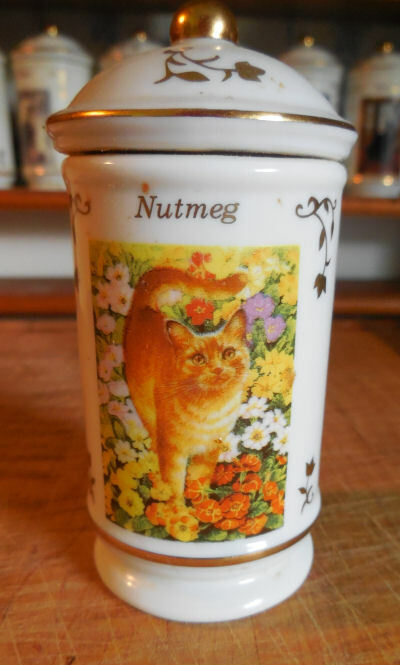 I also went to eBay and found this little beauty called “Nutmeg” available for $40.99! The moral of the story is….don’t throw out old kitchen items until you check value of them. I paid $2.99 each for my jars. Granted, this was 30 years ago, or so, but even counting for inflation, these jars have made me a tidy profit. My daughter has dibs on them already for when I am gone. Who knows what they will be worth then? Do you have any household items that have turned into investments for you? Please leave your comments below. Hi Cathee. I think my daughter would have my head on a platter if I sold them. She is a cat lover and she would be so disappointed not to get them when I am gone. Thanks for the offer though. I hope you find a set at a reasonable price. I had no idea until recently how expensive they are to get. Hi Tim, I would be interested! Are you still selling? Hi Tim, I am interested! Are you still selling? Hi Tim, are you still selling? Hi Tim! Are you still selling? I was gifted a set as well about 5 years ago. I just put in my curio and really have no clue what to do with them.